Love those polka dot pants! Such a great look! What a rockin' pair of pants! So darn sweet, girl! In love with this black, white, and red combo! You look gorgeous! Omg, love the shoeeees! The match perfectly with the pants. Those pants are so cute! Love the jacket and top with it. You look so chic! Pretty outfit- love the heels! Love these pants! And the pop of red is perfect! Black, red and white will always be a perfect combo! 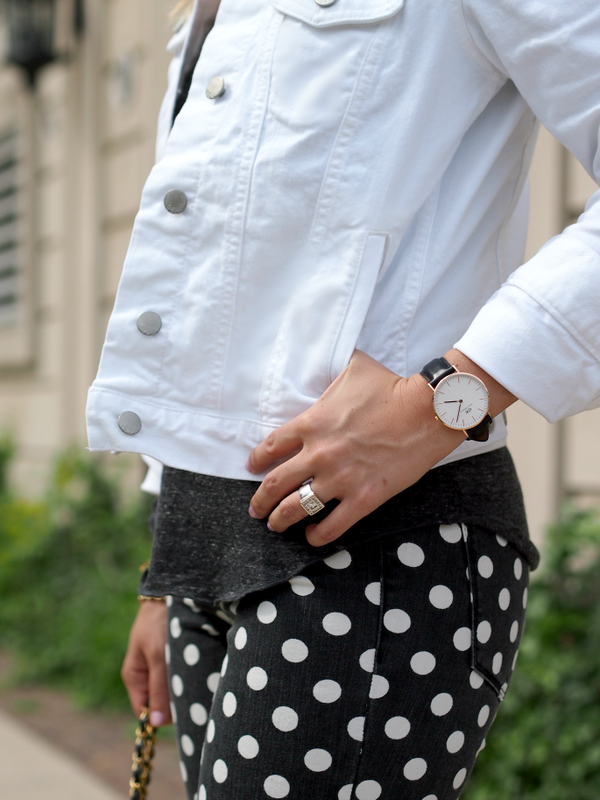 Love those pants and the jacket is such a perfect match! The shoes are amazing...such an amazing pop of color! Great polka-dot jeans. And the red shoes with them look amazing. What a great outfit! Love the polka dots and red shoes. Cute look, I love it! I love the whole thing. But i'm really digging the watch. Simple and chic. Those pants are so cute! Love that pop of red! Red & some polka..love the combination!